Blogs have become an increasingly popular form of online information and opinion exchanges, particularly amongst Generation Y. This study examines factors important to Generation Y in determining their trust judgment toward blogs. Study data include twenty-eight in-person interviews and 344 survey responses from Generation Y who read blogs for lifestyle tips and information. Results indicate that trust toward blogs by a blog reader is built on judgments along three dimensions: content, design and the perception of a blogger. Within each dimension, judgments are based on the evaluation of several specific criteria: Content-related criteria include authenticity, curation, and the frequency of posts; design-related criteria include aesthetics, organization, and image qualities; criteria related to the reader’s perception of a blogger include perceived expertise/reputation and motives of the blogger. This study also finds that trust directly affects a blog reader’s willingness to return to the blog and to recommend it to others. Specifically, speed of navigation and a perceived similarity between the blog writer and the blog reader have direct effects on a blog reader’s willingness to return, while information curation, aesthetics, and reputation have direct influence on the blog readers’s willingness to recommend the blog to others. Keyword – Trust, Content, Design, Perception toward a Blogger, Retention, Referral. Relevance to Design Practice – As with other forms of information exchange, the extent to which a consumer accepts the information from a blog heavily depends on how much he/she trusts the blog. Therefore, it is important for design managers to understand the ways in which consumers build trust toward a blog in order to utilize a blog as an effective source of information communication. Citation: Colucci, C., & Cho, E. (2014). Trust inducing factors of Generation Y blog-users. International Journal of Design, 8(3), 113-122. Received April 1, 2013; Accepted March 15, 2014; Published December 31, 2014. Copyright: © 2014 Colucci and Cho. Copyright for this article is retained by the authors, with first publication rights granted to the International Journal of Design. All journal content, except where otherwise noted, is licensed under a Creative Commons Attribution-NonCommercial-NoDerivs 2.5 License. By virtue of their appearance in this open-access journal, articles are free to use, with proper attribution, in educational and other non-commercial settings. Cara Colucci is a graduate of School of Design Strategies at Parsons, The New School for Design. Erin Cho is an associate professor in Strategic Design and Management at the School of Design Strategies at Parsons, The New School for Design, in New York. She finished her Ph.D. degree from the University of Wisconsin-Madison, specializing in supply chain management for global sourcing. Her current research areas include design management, branding, innovation, e-commerce, and sustainability. She also has a wide range of funding and entrepreneur experiences supported by such sources as The New School, the Center of International Business Education and Research, the Filene Research Institute, etc. Blogs are generally defined as chronological publications of personal thoughts and web links that are traditionally text-based, but also include a variety of audio and visual formats (Chai & Kim, 2010). Blogging activities on the Internet have dramatically increased in recent years, as people and organizations alike use blogs to share, spread, and formulate information and opinions. For example, about 181 million blogs were available on the World Wide Web in December 2011 as compared to approximately three million blogs in 2004 (Nielsen, 2012). In 2010, a new blog was created every second, making the blogosphere, as it has since been termed, sixty times larger in 2010 than it was in 2007 (Technorati, 2011). Blogs are now recognized as one of the most powerful forms of media and a highly influential communication tool for the 21st century. The surge of online blogging, often cited to have begun sometime in 2004, also coincides with the coming of age of a large portion of Generation Y to young adulthood. This overlap makes blogs significantly relevant to the digitally-connected lives of this demographic. The information provided by blogs, specifically in the form of peer recommendations, is particularly influential for Generation Y, and is often valued over expert opinions (Williams, Page, Petrosky, & Hernandez, 2010). As Generation Y becomes the dominant consumer base in the marketplace (Park & Lee, 2005), effectively designing and managing blog communication tailored to this demographic should be of significant interest to design managers. Despite the growing significance of blog communication, there is only a sparse amount of research on the topic of blog trust that has been conducted in a systematic way. While a collection of opinion-based web articles has attempted to discuss blog trust from a subjective point of view (e.g., Gothly, 2014), they are mostly concerned with increasing the marketing efforts of the blogger. Furthermore, past literature on design management has been centered on examining how a firm better develops and distributes its products and services to its consumers, with little discussion focused on how design management can increase the effectiveness of individual consumer offerings to peer consumers. While existing research does discuss trust and knowledge-sharing from the viewpoint of the blogger (e.g., Chai & Kim, 2010), as well as the general importance of blog trust on user behavior (e.g., Wu & Lee, 2012), little attention has been paid to understanding the specific parameters that constitute blog trust in the eyes of the blog reader. This study seeks to identify and define those parameters. To do so, we investigate specific factors that blog readers rely on when making a trust judgment about a blog. We also test the extent to which blog trust affects the reader’s intention to stay with the blog in the future and the reader’s willingness to refer the blog to others. Given the lack of comprehensive research on this issue, we first began by conducting an exploratory study using a qualitative method of personal interviews, followed by a quantitative survey method to validate findings. The results of this study provide design managers with specific information on how to increase readers’ trust of blog communications, blog-user retention, and user recommendations, all of which should contribute to the successful management of blog activities. A critical element of design management is understanding the target segment. To better understand why Generation Y responds to the blogging community, a definition of this generation and an understanding of the attitudes and interests unique to this generation is necessary. Although there is room for subjectivity, it is generally agreed that Generation Y (also known as the Millennial Generation, Net Generation, or Echo Boomers) comprise the demographic cohort that followed Generation X and are born between the mid 1970s and mid 1990s (Advertising Age, 1993; Horovitz, 2012). In temperament, Generation Y is marked by hopeful perceptions and grand ambitions, while paradoxically prone to boredom and short attention spans (Marciniak, 2002). Also contradictory is this generation’s expressed need for privacy, while valuing intrusive media such as reality TV and social networking sites (Paul, 2001). Often described as self-absorbed and self-reliant, Generation Y is also characterized by a heightened sense of autonomy. Despite their sense of independence, they demonstrate a greater need for peer acceptance and positive reinforcement, as well as a personal need to fit in and stay connected through tools such as social networking sites (Heaney, 2007). Indeed, the technical savvy of Generation Y is one of their notable characteristics—new technologies have shaped the ways in which Generation Y view and interact with their world from a very early age (Constantine, 2010). Generation Y typically utilizes the digital network created by the Internet to work collaboratively and to quickly gather and share information (Gorman, Nelson, & Glassman, 2004). This trait is illustrated by the popularity of sites like Wikipedia and Facebook, whose existence is contingent on the body (or “network”) of independent individuals who co-create, connect, share, and exchange content and information on these sites. Eight key values are associated with Generation Y. These include choice, customization, scrutiny, integrity, collaboration, speed, entertainment, and innovation (Williams & Page, 2011). Not surprisingly, the last four of these values are often associated with technology. In particular, social networking and the increasing capacity of computing hardware have enabled Generation Y to exchange opinions and collaborate on new ideas in real time (Clark & Aufderheide, 2009). The growing popularity of blogging and video blogging (or “vlogging”) communities has evolved logically from these abilities, and blogging communities are now used by Generation Y for multiple purposes, including peer recommendations (Morton, 2002; Moore & Carpenter, 2008). Peer recommendations, coupled with the honesty, humor, and uniqueness offered by the blogging community (Art, 2009), make blogs a popular option and a go-to outlet for Generation Y, who are both seeking and confirming buying, trends and lifestyle advice. In terms of marketing products to this generational cohort, traditional techniques have proven to be much less effective because of this generation’s overall skepticism of the media (Moore & Carpenter, 2008). Instead, Generation Y has demonstrated a preference for word-of-mouth marketing: recommendations by individuals who have tried products first hand and who develop more of a personal, one-on-one relationship with a prospective buyer are most valued (Morton, 2002). The group is also intensely brand and fashion conscious, with these preferences primarily guided by brands that resonate with their peers. For all these reasons, blog communication has become a particularly critical and significant form of communication for Generation Y. Initially, blogs existed as bodies of text on a personal website or on a provider site such as blogspot.com. Updated daily or weekly, blogs typically appear in three basic forms as (1) a personal diary, (2) a resource for specialized information, or (3) a political commentary. The content is largely opinion, based on personal experiences, values, and attitudes and is delivered through a combination of pictures, video, and text. This personalized posting of information introduces an emotional component that allows blog readers to develop temporary social relationships. Through these means, bloggers actively create, share, and influence the opinions of their viewers in terms of brand loyalty and purchase decisions. The network of blogs that is available today plays a crucial role in creating trends, sharing news and opinion, and spreading information through word-of-mouth communication (Johnson & Kaye, 2004). Past literature indicates that there are three main reasons why blog readers consume blog content. First, blog readers often consume blog content for utilitarian benefits, such as making a specific task more efficient through saving time, money, and/or effort (Bickart & Schindler, 2001). Generation Y, in particular, views blogs as an easier way to sort through the clutter of the Internet and to garner trend advice and determine their own purchase decisions (Kaye, 2007). Second, for blog readers to be motivated to participate in a blog, they must find it entertaining or enhancing of their online experience in some capacity or to some degree. Entertainment seekers, for example, value amusing and sensory-stimulating experiences in return for their time spent (de Zuniga et al., 2007). Third, individuals use blogs for the information provided in the content. This information is used to supplement social and consumption behavior. Blog readers can communicate with each other about a specific interest or product category, acquire buying advice, or participate directly in complaint and compliment interactions (Sanderson, 2010). The review of trust literature indicates that at least three different views exist for characterizing trust: (1) trust as an individual personality characteristic (e.g., Rotter, 1971); (2) trust as an expectation or belief that one individual has regarding the other person in a relationship for exhibiting expected behaviors (e.g., Lewis & Weigert, 1985; Shapiro, 1987); and (3) trust as an economic choice used by self-interest seeking actors (e.g., Frank, 1993; Heide & Miner, 1992). The definition of trust used in the majority of business literature, however, often takes the second view and emphasizes the expectancy aspect with regard to the ability, motive, and behavioral intention of the other (Anderson & Weitz, 1992; Mayer, Davis, & Schoorman, 1995). Although conventional definitions of trust have presumed the context for trust is a relationship between individuals in the physical world, the Internet and new venues of online retail have allowed this concept to be translated to the virtual environment. Specifically, online trust refers to an individual’s belief that an online exchange partner is dependable, able to fulfill promised roles or obligations, genuinely interested in the welfare of consumers and refrains from opportunistic behaviors if given that chance (Cho, 2006; McKnight, Choudhury, & Kacmar, 2002; Williams & Kitchen, 2009). Building on this conceptualization, we can define blog trust as a blog reader’s expectations of a blogger’s positive ability and intention for his/her information sharing. Past studies have associated online trust with several evaluative factors. While different studies have assigned different weights to these potential influencers, the factors include credibility, benevolence, reputation, personal experience, persuasiveness, and rapport. Credibility—or the belief in an individual’s expertise, benevolence or concern for the user’s best interest—is most often cited as the key underlying dimensions of online trust (Cho, 2006; McKnight et al., 2002). Precursors to credibility include the reputation of the information provider and the amount of experience the user has with the online source. Other research maintains that levels of risk in the environment, persuasiveness, and communication qualities will take precedence in trust perception. While not specifically related to blog communication, a number of studies have examined what determines website credibility. Here reputation, past experience with the site, accuracy of the information, and company motives were indeed found to be significant considerations in judging website credibility (Fogg, et al., 2001a, 2001b, 2003). In contrast to company-operated websites, and perhaps because of the interpersonal nature of blog communication, blog trust also hinges on the evaluation of the blogger as a person and the extent to which blog readers identify with the blogger. Studies on interpersonal communication have argued that rapport, built upon the similarities between two interacting parties, is extremely influential in building trust. Relevant similarities can include demographics, tastes, and lifestyle, all of which highly influence trust of an information source. These similarities will act as a barometer of the likelihood that the information source will critique products in a way that is similar to that of the information seeker (Smith, Menon, & Sivkumar, 2005). An alternative perspective on the concept of online trust suggests that online trust can arise from design-related attributes of a blog site. Zhang et al. (2009) assert that “professional looking design and the way in which the site interacts with the customer are sources for building online trust. Such interface cues can induce and inspire a customer to trust a website and its products or services” (p. 45). Fogg et al. (2003) also found that “design look” was the most dominant criterion when evaluating web credibility, which the researchers attributed to study participants’ lack of motivation to process the given website thoroughly. Other studies have shown that such superficial methods to judge the trustworthiness of web content, at least during the initial stage of trust evaluation, are one means users employ while navigating the vast body of information available on the web (Cockburn & McKenzie, 2001; Fogg et al., 2003). Design has other influences on consumer perceptions of web content. Consumer psychologists, for example, suggest that consumer judgment often depends on incomplete or limited knowledge of the relevant information (Kardes, Posavac, & Cronley, 2004). The design quality of a blog site can serve as a mechanism to fill these gaps. In particular, design that enhances the efficiency of information presentation appears to be critical. In this regard, design managers should pay particular attention to the location of information and graphics, and to make sure that the use of design elements are not distracting to viewers (McClure, Wyman, Beachboard, & Eschenfelder, 1997). Website design that increased the perceived ease of navigation has also been associated with trust (Gregg & Walczak, 2010). Navigation in this context is conventionally defined as the sequencing of web pages in a style that is consistent and organized. Navigation is an important design element because it reduces the effort exerted by the user, minimizing feelings of frustration and increasing feelings of confidence in the interface (Zhang, Prybutok, Ryan, & Pavur, 2009; Fogg et al., 2001a, 2001b). In sum, a review of the literature suggests that the trustworthiness judgment of a blog may involve evaluations of the following aspects: Credibility, intention, design, and rapport. However, given the lack of previous studies investigating which factors actually contribute to a perception of blog trust, this study seeks to explore and identify specific judgment criteria of blog trust. To compensate for the lack of previous study data on specific judgment criteria of blog trust, we used a two-stage data collection process. First, we first collected qualitative data, using in-depth interviews with twenty-eight Generation Y blog users as a means to discover emergent themes at work in blog perception. We then validated these themes using a quantitative Internet survey of 344 Generation Y blog users who read blogs for lifestyle tips and information. Data from in-depth interviews were analyzed using an inductive process to identify high-level categories or themes. This same process produced subcategories within themes. These categories, themes and subthemes were recontextualized and supported with direct quotes extracted from the interview data. Using an iterative interview-and-review process, the output of each interview was compared to previous interviews to refine and confirm the categories and their elements. We used the final category structure to organize the interview findings as presented in this study. The interviews were conducted from a sample of Generation Y recruited from online communities through references gained via personal contacts. The important criteria for the recruitment were that the individuals participated in lifestyle blogging activities in the past six months and belong to the age range of Generation Y. The data collection process was accomplished over a three-month period and culminated in a total of twenty-eight interviews. Each interview ranged from twenty to thirty minutes. Interviews were conducted in person and recorded on video. All interviews were transcribed for analysis. Although data collection involved feedback from a seemingly small number of interviewees, the findings reached a level of theoretical saturation considered to be sufficient for the exploratory purposes of this study (Strauss & Howe, 1991). Interviewees were first presented with a short description and a definition of a blog. Following this description, interviewees were asked to provide their name, age, gender, level of education, number of years using the Internet, number of years following blogs, and a short list of blogs they frequently visited in the past six months. These data were collected to address any possible discrepancies in responses based on either the level of experience or differences in types of blogs regularly viewed by the interviewees. After general background information was collected, respondents were asked to answer a variety of open-ended questions related to specific blogs visited, level of participation, evaluative aspects of blogs, and possible ethical concerns regarding obtaining information from blogs. Respondents were first asked a general question, such as “What are some of the factors you use to judge the trustworthiness of the blogs you follow?”, and later asked to respond to a potential trust component, such as the appearance and design of the blogging site. This strategy allowed the interviewees to first speak in an uninfluenced way about their own trust criteria before being prompted to comment on more specific trust components supplied by the interviewer. After completing the interviews, all audio files were transcribed for further analysis. Transcription analysis was conducted by three reviewers specializing in consumer research, using thematic analysis and intercoder reliability procedures to ensure valid findings. 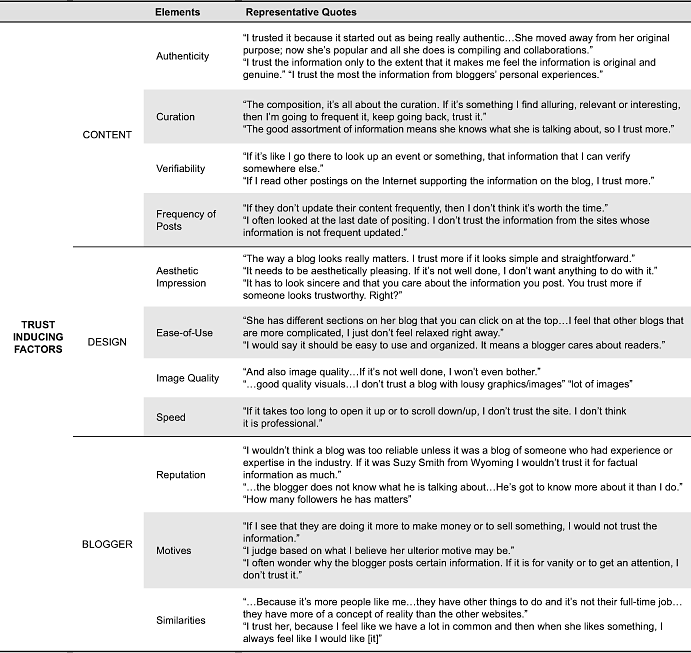 Reviewers independently examined transcripts for respondents’ words that described evaluation criteria related to trust toward blogs and bloggers and the consequences of trust. Identified texts were coded and assigned tentative categories of evaluative criteria. Reviewers then compared all texts within a category to ensure content congruency of each category. Reviewers were allowed to assign a text to multiple categories, but were instructed to do so in a way that maximized both content homogeneity of each category and heterogeneity between categories (Lincoln & Guba, 1985). The identified text elements and their assignment to categories were then compared across reviewers and adjusted. In terms of the main categories of evaluation criteria for trust judgment, all three coders identified ‘contents,’ ‘design,’ and ‘bloggers,’ thus recording a 100% inter-coder agreement. The assignment of text to categories varied slightly in the first round of identification, recording an average of .85 correlation between coders. After the first round of analysis, coders discussed to compare, verify, and confirm the final elements and their assignment to categories. The results are presented in Table 1. Table 1. Summary of interview results and representative statements. Using data collected in the interviews, we developed a questionnaire to quantitatively examine the extent to which the identified elements were indeed critical in building blog users’ trust perceptions toward a blog. In this survey, we asked respondents to identify the lifestyle blog they had visited most recently in the past six months. They were then asked to evaluate that blog using the trust-inducing elements identified in the interviews (e.g., the perception of blog content as authentic, frequently updated, aesthetically designed, etc.). For a list of specific questions, please see Table 2. In addition, we asked respondents to indicate the extent to which (1) they would trust that blog, (2) they would come back to the same blog in the near future if needing similar information and (3) they would recommend the blog to others. We collected this data using an online survey with the help of a marketing research company that provides Gen Y panels. The survey generated a total of 361 responses; of these, seventeen were discarded due to incomplete entries. The final data analysis was conducted on 344 responses. About 65 percent of the respondents were female, 55 percent had a college degree, and 60 percent had an income that ranged between $40,000 to $60,000. Table 2. Regression analysis for trust inducing factors on trust and retention. Blog trust was addressed through a series of qualitative interview questions and a quantitative survey tailored to this research component. The first discovery from the qualitative data is that trust is judged by blog readers based on three main categories: content, design, and blogger. The third category of trust involves the evaluation of the blogger, which includes the blogger’s reputation and expertise. Bloggers who are active within the industry they blog about or who possess some sort of research-based background on the topic of the blog are considered to be more trustworthy than a blogger with no independent basis for the opinions he or she expressed. Some blog users express that they try to find quantitative information about a blog’s reputation; the number of blog followers is one easily-obtained and factual metric cited by some interviewees. The perceived motives of a blogger also play a role in trust. Study participants often speculated about the hidden motivations of bloggers who posted certain information. As a result, blog sites with heavy marketing and product information were evaluated as less trustworthy. Lastly, blog users expressed more trust of bloggers who demonstrated personal qualities that were similar to themselves. Blog users felt their own opinions and measurements of judgment were more likely to coincide with those of the blogger, thus making any blog recommendations or posts a good fit to that particular blog user. Table 1 summarizes these results and includes representative quotes. To test the generalizability of the trust factors identified through qualitative interviews, we conducted a quantitative study with 344 responses collected through an online survey. As the first step of validation, we tested the measurement model with confirmatory factor analysis using the maximum likelihood method. In particular, we examined how well the eleven elements identified in the interviews represented and corresponded to the respective categories of blog trust: content, design, and blogger. We also examined the measurement model in terms of convergent and discrimant validity. The results showed a good fit (χ2 (41) = 168.7; p < .05; AGI=.91; CFI = .96; NFI = .96). All factor loadings exceeded the threshold of .60 and signficant at p < .001 and composite reliabilites for all the measures were over .80, meeting the minimum criterion of .70 (Nunnally and Bernstein, 1994). The results also indicated that correlations across constructs were below the validity threshold of .85 (Brown, 2006). The average variance extracted (AVE) values for all constructs were greater than the validity threshold value of .50 (Fornell & Larcker, 1981). Thus, the construct, convergent, and discriminant validity of the model was supported. A regression analysis was used to examine the statistical significance of identified elements in actually determining blog users’ trust perception of a blog. We also examined the extent to which trust of the blogger affects a user’s willingness to come back to the blog and their willingness to recommend that blog to others. As presented in Table 2, the results show that the user’s assessment of posted blog content/information as authentic and genuine (β = .53, t = 4.63, p < .005), well-curated with relevant information (β = .25, t = 2.18, p < .05), and frequently updated (β= .29, t = 2.85, p < .005) were significant in inducing trust toward a blog, while verifiability was not (β = .15, t = 1.53). In terms of blog designs, blogs that looked aesthetically pleasing and organized (β = .22, t = 2.28, p < .05) and used good quality images (β =29, t = 2.90, p < .005) were found to be significant, while ease of use (β = .19, t = 1.83) and fast response (β = .14, t = 1.29) were not statistically significant. The results also indicated that a blogger’s reputation (β = .32, t = 2.60, p < .05) and motives (β = .24, t = 2.38, p < .05) were significant trust-inducing factors, while similarity to the blog user was not (β = .07, t = .68). 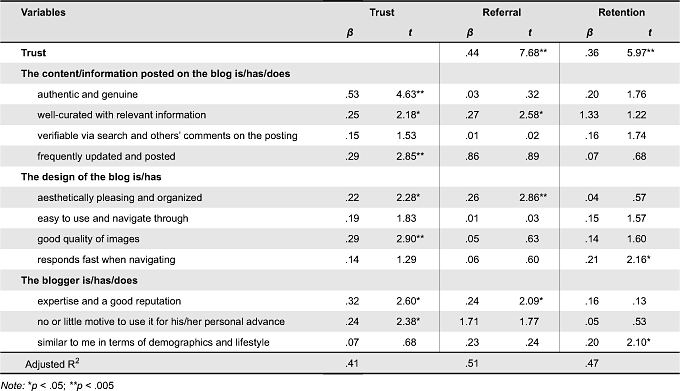 In terms of behavioral intention, the results indicated that trust was critical (β = .44, t = 7.68, p < .005) in determining a blog user’s willingness to recommend a blog to others. We also found that having the site well-curated with relevant information (β = .27, t = 2.58, p < .05), the aesthetics of the blog (β = .26, t = 2.85, p < .005), and a blogger’s reputation (β = .24, t = 2.09, p < .05) had significant direct effects on the willingness to recommend that blog. As for willingness to return to the blog, we found that trust (β = .36, t = 5.97, p < .005) was critical and fully mediated all the factors that were found to be significant with trust-building. In addition, we found that a blog’s ability to respond quickly to the user (β = .21, t = 2.16, p < .05) and the user’s belief that the blogger was similar to the blog reader (β = .20, t = 2.10, p< .05) had a significant direct effect on a blog user’s willingness to return. How to design effective online communication has been an issue of keen interest to design managers. While communication involves interactions between two sides (information providers and information receivers), the extant literature on design management has largely focused on how to assist the information provider, often leaving out the issue of how the information is perceived by the receiver. Thus, the current study investigates the perceptual judgment of information receivers and argues that receiver trust is the key factor for determining the effectiveness of information exchange online. More specifically, we focus on blog communication, a form of information exchange that has grown dramatically in recent years and is also used frequently and widely by Generation Y. This context offers another significance, as the studied exchange occurs between individuals, as opposed to between firms and consumers (B2C). The C2C (consumer to consumer) interactions are becoming an important form of exchange relationship online as people tend to rely more on information provided by other individuals than by corporations. Although trust is found to play a vital role in interpersonal communications, critical understanding of what constitutes blog trust is still lacking. Our study addresses this issue and the results indicate the following implications. While the primary purpose of blogs is the dissemination of information, our interview respondents mentioned their concern for blog design quite frequently. In fact, design encompassed a large part of the trust discussion and was significantly linked to retention. Design was considered to be symbolic of the larger issue of professionalism on the part of the blogger. The quantitative analysis also supported the importance of the aesthetics of a blog’s design, as well as the importance of good quality images, for engendering blog trust. After all, trust is not a directly observable quality. When people try to infer the hidden quality of a product or service, they often rely on cues they can readily and objectively evaluate. There appears to be a tendency to treat blog design and the quality of images as such information; that is, visual elements convey additional information about bloggers’ ability and sincerity. The aesthetics and image quality also appear to be used by blog readers as tools to elaborate on and validate the information they are reading. In fact, the importance of physical and visual cues in building trust has been reported in the past in the interpersonal context. In interpersonal interactions, especially with strangers, trust is linked closely to physical appearance. People tend to associate physical attractiveness with many positive characteristics, such as intelligence, competency, and leadership skills (Wilson & Eckel, 2006). Based on the expectations of those characteristics possessed by attractive individuals, physical attractiveness promotes feelings of trust. The results from our study indicate that a similar judgment is also present when forming blog trust. Website design is also important as it is directly related to usability (Gregg & Walczak, 2010) and also minimizes feelings of frustration (Pavlou, 2003). Our results indeed support that consumers tend to trust a blog that is easy to use. Studies on website design have indicated that consumers prefer simple graphics (e.g., McClure et al., 1997). Our results also showed that the key aesthetic quality of blog design leading to trust is simplicity. Simple colors, graphics and information layouts are more conducive to generating trust. It is also important for design managers to understand that blog trust involves more than visual design. Particularly for information sources from which consumers obtain decision-relevant information, the extent to which consumers perceive the content of information to be trustworthy is critical. Among content-related elements leading to blog trust, we found that authenticity of information is vital. Authenticity is achieved by staying true to the original intentions of a blog and what the blogger initially establishes as the blog’s purpose. Many interviewees described feeling discontentment and frustration when blogs changed in meaning, typically induced by blog commercialization over time. The quality of information curation is found to be another critical trust-inducing factor. The interview results alluded that curation not only relates to the credibility of the blog content, but also the judgment on bloggers’ thoughtfulness and intelligence. The frequency of posting is also an important content-related criterion, which further underscores the value of blog readership being able to ‘stay current’ according to blog readers. Indeed, the currency of information is a major benefit of blogs as compared to other, usually less updatable media. Not only do frequent posts contribute to a more pleasant and worthwhile blogging experience, but they are also used to evaluate how committed a blogger is to his/her blog. Because bloggers are often situated behind the scenes, the blog readers in our study tended to look for information about a blogger’s expertise/reputation and the motives for blogging activities in order to render a trust judgment. In addition to content and design cues that blog readers use to infer a blogger’s ability and motives, our results show that perceived expertise and the reputation of the blogger have significant and direct effects on trust-building. Blogger expertise and reputation appear to be related to information credibility. For example, the legitimacy of information regarding health-related or factually-based blog topics was viewed with general skepticism, unless a blogger was professionally trained in such an area. Motive refers to bloggers’ engaging in blogging activities for personal advancement as opposed to the genuine desire to help blog readers by supplying useful information. In particular, blog readers appeared to have developed a keen eye for spotting endorsements and assessing any information appearing thereafter with skepticism and moderation. They noted that the possibility of dishonest evaluations due to money-fueled motivations definitely existed. In addition to identifying specific trust-inducing factors, we also examined the effect of trust on behavioral intention. Specifically, we investigated the role of trust in a blog reader’s willingness to return to the blog and to recommend that blog to others. The former is critical for retention and the latter is important for growth of blog readership. We found that trust has a significant and direct influence on reader retention, and can mediate the effects of content, design, and blogger-related evaluations found to be critical in trust-building. In addition, the response time of a blog and the similarity of a blogger’s characteristics to a blog reader increased the chances of the reader returning to the same blog when a similar information need arises in the future. It may be due to the fact that as usage increases, a blog reader tends to care about the time efficiency when accessing a blog and desires to develop a personal connection with the blogger. As for a reader’s willingness to recommend a blog, trust was found to be critical as well. It also appears that the willingness to recommend involves a more careful consideration of a blog’s key attributes than a willingness to return. While the effects of information curation, the aesthetics of the blog, and the expertise/reputation of the blogger were mediated via trust on the willingness to return, these factors had significant and direct influences on the willingness to recommend. These results may be due to the fact that the act of recommendation, to a degree, is putting a blog reader’s own reputation on the line, thus activating a more thorough evaluation of the blog’s qualities, in addition to relying on his/her own trust judgment. In summary, this paper explores the factors that are critical to trust-building, retention, and referral in the lifestyle blogging community among Generation Y cohorts. Our study makes an important contribution to theory development concerning the topic of blog trust. Despite the significance of blogging activities in interpersonal communication nowadays, literature on blog trust from the blog reader’s perspective has mostly been confined to opinion-based web articles. By identifying key themes for blog trust with qualitative data and validating them through quantitative data, this study provides the ground for further conceptual development concerning blog trust. The broad range of interview findings and the quantitative validation of those findings through survey data also produced several new conclusions, in addition to the future implications discussed above. Design managers can apply these insights to increase the effectiveness of blog communication. Although the most common use of blogs is for information transmission between individuals, blogs can also be used by a firm to communicate with both current and prospective consumers. It will be an interesting future extension of this study to examine whether trust-inducing factors will differ when an organization uses blogs for brand communications. For this effort, we emphasize the importance of design mangers paying close attention to other critical perceptual elements, in addition to what we report here, when seeking determinants of consumer judgment and behavioral intentions in a corporate context. The current study was conducted with the funding support by Strategic Design Management, School of Design Strategies at Parons, the New School for Design. Anderson, E., & Weitz, B. A. (1992). The use of pledges to build and sustain commitment in distribution channels. Journal of Marketing Research, 29(1), 18-34. Art, M. M. (2009). Marketing to generation Y: Messages that get their attention. LIMRA’ s MarketFacts Quarterly, 28(1), 16-23. Bickart, B., & Schindler, R. M. (2001). Internet forums as influential sources of consumer information. Journal of Interactive Marketing, 15(3), 31-40. Chai, S., & Kim, M. (2010). What makes bloggers share knowledge? An investigation on the role of trust. International Journal of Information Management, 30(5), 408-415. Cho, J. (2006). The mechanism of trust and distrust forming and their relational outcomes. Journal of Retailing, 82(1), 25-35. Cockburn, A., & McKenzie, B. (2001). What do web users do? An empirical analysis of web use. International Journal of Human Computer Studies, 54(6), 903-922.
de Zuniga, H. G., Lewis, S. C., Willard, A., Valenzuela, S., Lee, J. K., & Baresch, B. (2007). Blogging as a journalistic practice: A model linking perception, motivation and behavior. Journalism, 12(5), 586-606. Dey, I. (1993). Qualitative data analysis: A user-friendly guide for social scientists. New York, NY: Routledge. Ebenkamp, B., & Marciniak, J. (2002). Why aren’t they worried? Brandweek, 43(32), p. 29. Fogg, B. J., Marshall, J., Laraki, O., Osipovich, A., Varma, C., Fang, N., … Treinen, M. (2001a). What makes a web site credible? A report on a large quantitative study. In Proceedings of the SIGCHI Conference on Human Factors in Computing Systems (pp. 61-68). New York, NY: ACM. Fogg, B. J., Marshall, J., Kameda, T., Solomon, J., Rangnekar, A., Boyd, J., & Brown, B. (2001b). Web credibility research: A method for online experiments and some early study results. In Proceedings of the SIGCHI Conference on Human Factors in Computing Systems (Extended abstracts, pp.295-296). New York, NY: ACM. Fogg, B. J., Soohoo, C., Danielson, D. R., Marable, L., Stanford, J., & Tauber, E. R. (2003). How do users evaluate the credibility of Web sites? A study with over 2,500 participants. In Proceedings of the Conference on Designing for User Experiences (pp. 1-15). New York, NY: ACM. Frank, R. H. (1993). The strategic role of emotions: Reconciling over- and undersocialized accounts of behavior. Rationality and Society, 5(2), 160-184. Generation Y. (1993, August 30). Editorial. Advertising Age, 64(36), 16. Gorman, P., Nelson, T., & Glassman, A. (2004). The millennial generation: A strategic opportunity. International Journal of Organizational Analysis, 12(3), 255-270. Gregg, D. G., & Walczak, S. (2010). The relationship between website quality, trust and price premiums at online auctions. Electronic Consumer Research, 10(1), 1-25. Heaney, J. (2007). Generation X and Y’s internet banking usage in Australia. Journal of Financial Services Marketing, 11(3), 196-210. Heide, J. B., & Miner, A. (1992). The shadow of the future: Effects of anticipated interaction and frequency of contact on buyer-seller cooperation. Academy of Management Journal, 35(2), 265-291. Johnson, T. J., & Kaye, B. K. (2004). Wag the blog: How reliance on traditional media and the internet influence credibility perceptions of weblogs among blog users. Journalism and Mass Communication Quarterly, 81(3), 622-642. Kardes, F. R., Posavac, S. S., & Cronley, M. L. (2004). Consumer inference: A review of processes, bases, and judgement contexts. Journal of Consumer Psychology, 14(3), 230-256. Kaye, B. K. (2007). Blog use motivations: An exploratory study. In M. Tremayne (Ed. ), Blogging, citizenship, and the future of media (pp. 127-48). New York, NY: Routledge. Lewis, D. J., & Weigert, A. (1985). Trust as a social reality. Social Forces, 63(4), 967-985. Moore, M., & Carpenter, J. M. (2008). Intergenerational perceptions of market cues among US apparel consumers. Journal of Fashion Marketing and Management, 12(3), 323-337. Morton, L. P. (2002). Targeting generation Y. Public Relations Quarterly, 47(2), 46-48. Mayer, R. C., Davis, J., & Schoorman, F. D. (1995). An integrative model of organizational trust. Academy of Management Review, 20(3), 709-734. McClure, C. R., Wyman, S. K., Beachboard, J. B., & Eschenfelder, K. R. (1997). Developing system-based and user-based criteria for assessing federal websites. Journal of the American Society for Information Science, 34, 78-88. Paul, P. (2001). Getting inside Gen Y. American Demographics, 23(9), 42-49. Rotter, J. B. (1971). Generalized expectancies for interpersonal trust. American Psychologist, 26(5), 443-452. Shapiro, S. P. (1987). The social control of impersonal trust. American Journal of Sociology, 93(3), 623-658. Smith, D., Menon, S., & Sivakumar, K. (2005). Online peer and editorial recommendations, trust, and choice in virtual markets. Journal of Interactive Marketing, 19(3), 15-37. Strauss, W., & Howe, N. (1991). Generations: The history of America’s future, 1584 to 2069. New York, NY: William Morrow. Williams, K. C., & Page, R. A. (2011). Marketing to the generations. Journal of Behavioral Studies in Business, 5(1), 1-17. Williams, K. C., Page, R. A., Petrosky, A. R., & Hernandez, E. H. (2010). Multi-generational marketing: Descriptions, characteristics, lifestyles and attitudes. Journal of Applied Business and Economics, 11(2), 21-37. Williams, R., & Kitchen, P. J. (2009). Involvement, elaboration and the sources of online trust. International Journal of Technology and Human Interaction, 5(2), 1-10. Wilson, R., & Eckel, C. C. (2006). Judging a book by its cover. Political Research Quarterly, 59(2), 189-202. Wu, W., & Lee, Y. (2012). The effect of blog trustworthiness, product attitude, and blog involvement on purchasing intention. International Journal of Management & Information Systems, 16(3), 265-275. Zhang, X., Prybutok, V. R., Ryan, S., & Pavur, R. (2009). A model of the relationship among consumer trust, web design and user attributes. Journal of Organizational and End User Computing, 21(2), 44-66.